Featuring Mattie Cobb and her K-9 police dog partner Robo, Burning Ridge by critically acclaimed author Margaret Mizushima is just the treat for fans of Alex Kava. On a rugged Colorado mountain ridge, Mattie Cobb and her police dog partner Robo make a grisly discovery--and become the targets of a ruthless killer. Colorado's Redstone Ridge is a place of extraordinary beauty, but this rugged mountain wilderness harbors a horrifying secret. When a charred body is discovered in a shallow grave on the ridge, officer Mattie Cobb and her K-9 partner Robo are called in to spearhead the investigation. But this is no ordinary crime--and it soon becomes clear that Mattie has a close personal connection to the dead man. A deranged killer torments Mattie with a litany of dark secrets that call into question her very identity. 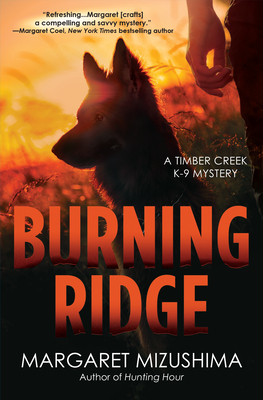 As a towering blaze races across the ridge, Cole and Robo search desperately for her--but time is running out in Margaret Mizushima's fourth spine-tingling Timber Creek K-9 mystery, Burning Ridge. Margaret Mizushima is the author of the critically acclaimed Timber Creek K-9 mysteries. Her first novel, Killing Trail, was named Debut Mystery of the Month by Library Journal and was an RT Reviewers' Choice Award nominee. She balances writing with assisting her husband with their veterinary clinic and Angus cattle herd. They live on a small ranch in Colorado where they raised two daughters and a multitude of animals. This is her fourth mystery.